The BBC micro:bit plus Kitronik MI:power board. This pack also includes a 1M anti tangle USB cable for connecting to your computer. The Ultimate in portability. BBC micro:bit with a MI:power board for the BBC micro:bit and a 1M anti tangle USB Cable. Your BBC micro:bit will come in one of 4 colour schemes, unfortunately it is not possible to specify which colour you will receive. 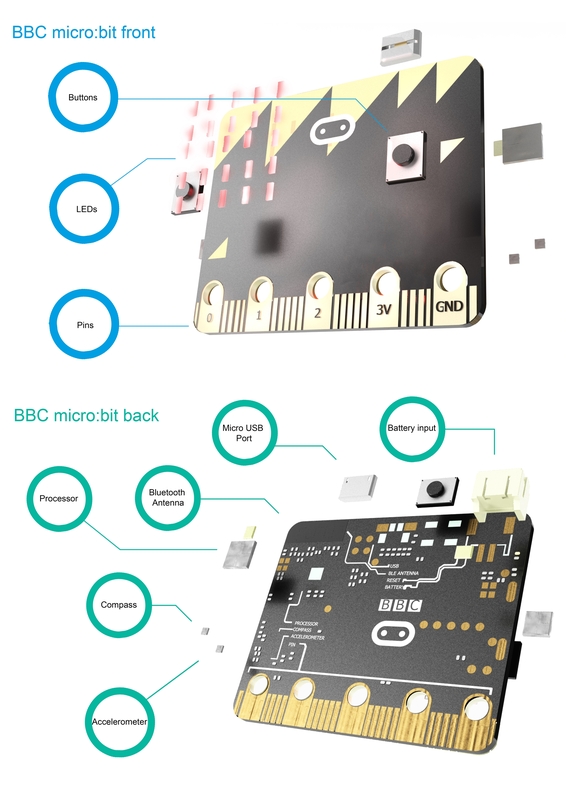 The MI:power board for the BBC micro:bit brings real portability to your wearable projects. The stylish, lightweight PCB is designed to fit snugly against the BBC micro:bit and features a built in buzzer and 3V coin cell holder. When assembled, the MI:power board is connected directly to the 3V, GND and P0 connections on the micro:bit. The 3V and GND connections provide power to the micro:bit and the built in buzzer is connected to P0, which is the default output pin when using the audio functions in the Block Editor software. The board has an easy to access on/off switch, which makes it easy to turn a project on and off, rather than have to disconnect the power supply from the BBC micro:bit. Once the unit is assembled and attached to the BBC micro:bit the mechanical fixings prevent the battery from being removed unless you use a screwdriver, so whatever the use, the battery will remain safely in place. Spacers, fixings and a battery are all provided. Power your BBC micro:bit from a stylish PCB. 1 x MI:power board for the BBC micro:bit. 3 x Counter Sunk M3 x12mm Machine Screws. 3 x M3 Hex Full Width Nuts. 1 x CR2032 3V Coin Cell. Hi Sara, This product is now back in stock and available for same day dispatch if the order is received before 3pm.